What have I learned about toddlerhood thus far? Well, many things. I’ve learned that the maniacally cheerful toddler CD he demands to listen to in the car will get stuck in your head and you will sing it in random places and situations, whether you want to or not. I’ve learned that no matter what, the food off your plate will always be more appealing, even if you are both eating the exact same thing. I’ve learned that their little development spurts can happen on a dime, and any mood swings that follow will hit you like a big Mack truck. I’ve learned a sense of humor goes a LONG way. I’ve also learned that no matter how tired and frazzled you are the end of the day with your crazy little person, their sweet little smiles and cuddles make you melt into a gooshy puddle on the floor with happiness. Being tired, as all mothers well know, comes with the territory of having a toddler, but if you are always feeling tired or sluggish, you may want to get your iron levels checked. Iron-deficiency anemia is not that uncommon in women of childbearing years due to “our friend at the end of a sentence” and the increased blood supply demands during pregnancy. Young kiddos and those with chronic diseases are more at risk for anemia too. Good sources of iron include red meat, seafood, poultry, fortified breakfast cereals, legumes, spinach, and dark chocolate (woohoo!) to name a few. Animal sources have what is called heme-iron, which is the more readily absorbed form of iron. Foods rich in vitamin C, such as in many fruits and vegetables, aid in the absorption of iron. If you ever are taking an iron supplement, it can be better absorbed when taken with a vitamin C supplement, or maybe with a glass of orange juice. Avoid taking iron supplements at the same time with calcium, as calcium can actually block absorption of iron. Split them up. -1 10 oz package frozen spinach (Can also use fresh. Frozen is what I had on hand and worked well. Brown meat with chopped onion in a large skillet. Drain off fat. 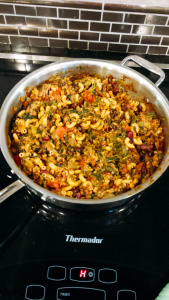 Stir in canned goods, macaroni, chili powder, and garlic powder. Bring to a boil, then reduce heat. Stir well, simmer for about 10-15 minutes more, or until macaroni is tender and spinach is cooked through. Remove from heat. If desired, sprinkle with cheese and mix well. Serve and enjoy! Can add salt and pepper to taste. Aside from being delicious and easy, I love this recipe because the vitamin C from the tomatoes enables you to better absorb all that iron-goodness from the beef, red beans, and spinach. Give it a shot, and let me know how it turns it out!